We almost didn't believe it when FCA first confirmed that it would build a Jeep Grand Cherokee that uses the Hellcat's 707 hp supercharged V8. We dreamt of a world where FCA stuffed the Hellcat motor into nearly every model, and it seems like our dreams have pretty much come true. 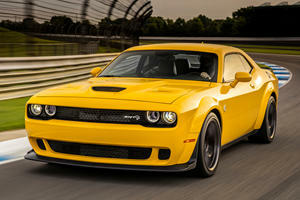 Soon enough, Dodge will only be known for its supercharged V8, and nothing else. Now that we have seen the Jeep Grand Cherokee Trackhawk in the metal, we have the awesome task of predicting how good it will be before getting some seat time in the not-so-distant future. 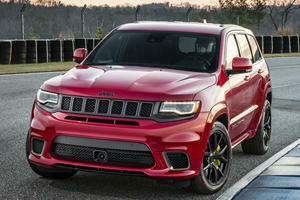 Before getting behind the wheel, we can only assume that the Trackhawk will be remarkably similar to the standard SRT8. Of course, the Trackhawk will be much faster, but in terms of driving dynamics, we doubt that much will change. So what does this mean exactly? The standard SRT8 Grand Cherokee has always punched well above its price class with a sub-$80,000 price tag. The car comes with a 6.4-liter V8 good for 475 hp and 470 lb-ft of torque. Even though this SUV weighs over 5,000 pounds, it's amazing how well it performs with a 0-60 time of just 4.4 seconds. With the Trackhawk, all of these numbers have been absolutely blown away. The Trackhawk gains 259 pounds over the standard SRT8, but is still able to hit 60 mph in 3.5 seconds with all of that extra power. 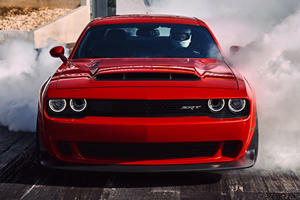 The car will complete the quarter-mile in 11.6 seconds, which Jeep says makes it the fastest production SUV in the world. The car has not been priced yet, but an $80,000 price tag wouldn't surprise us. What would shock us is the value for money that the Trackhawk will offer over other performance SUVs. A Cayenne Turbo S would cost around twice as much, and offer far less horsepower. In fact, all of the high-powered German SUVs will likely be left in the dust simply due to their price tags alone. We honestly see the biggest comparison being drawn to the Tesla Model X. Like the Trackhawk, the Model X bleeds red, white and blue. Both cars are American, but have little else in common besides speed and overall functionality. Doubtless, there will be many YouTube videos of these two SUVs drag racing, but at $135,000 for the P100D, even the Tesla can't match the Jeep on price. What we must do with the Trackhawk is throw away many of the pricing considerations, because anyone who cares that much about price is probably shopping for the base V6 version of all of the SUVs that we've mentioned. 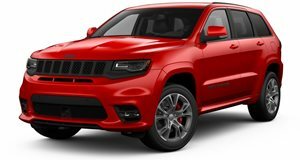 Instead, we need to focus on the overall package that is the Grand Cherokee SUV, and the special benefits that come from buying the Trackhawk model. We've always thought of the Grand Cherokee as the "blue collar Range Rover." Even though there are American SUVs with better badges like the Lincoln Navigator and Cadillac Escallade, the Grand Cherokee has always somehow been able to match them in appeal. Think about the people you know who drive a newer Grand Cherokee, it's cool without being obnoxiously expensive. Like many FCA models at the moment, the interior is nothing to gawk at, but it gets the job done. In fact, the Grand Cherokee has a similar center stack to the Maserati Ghibli and Quattroporte, and those are considered exotics. Somehow FCA has created a simple, usable interior that is also luxurious. The Grand Cherokee will never wow your tech-savvy friends like a Porsche or BMW SUV. Instead, the Trackhawk will wow them when you put your foot down and their ears are filled with the supercharged whine of that incredible engine. Whereas the Germans are all using future-proof technology like turbos and hybrids, Jeep just said "let's live in the moment." The Trackhawk reminds us of that early 2000s excess that resulted in cars like the Hummer H2. Like that car, the Trackhawk is overtly aggressive and made to piss off eco-conscious people. We love that it exists, but we can't help but wonder if FCA will ever be forced to come to its senses and build boring hybrid cars. We have no doubt that some manufacturer will come along and steal the fastest SUV crown from the Trackhawk. Perhaps Porsche will unveil a Cayenne with the new Panamera Turbo S E-Hybrid drivetrain, or the Bentley Bentayga will get a power boost. Or, Elon Musk could go mad and put out a new Model X called the P101D that beats the Trackhawk by 0.01 of a second. No matter what happens, we have to give credit to Jeep for pulling through with this car. We asked for it, Jeep built it, hopefully enough people will now go out and buy it. You may not want to keep the accelerator floored ALL the time.